Special Containment Procedures: Due to the nomadistic characteristics of the population of SCP-2595, containment is to be administrated collectively by Mobile Task Forces Sigma-19-01, -02 and -03 (receiving the callsigns of "Diplomatic Negotiators", "Census" and "Bulldozers", respectively). Mobile Task Force Sigma-19-01 is tasked with maintaining a diplomatic relationship with the upper classes of SCP-2595 in order to predict any sudden migration done by the community. In order to conceal SCP-2595 while preventing any change to its daily activities or behavior, Disinformation Protocol 2595-05-A is to be reinforced upon inhabited regions within a radius of fifty (50) kilometers of the current position of SCP-2595. Mobile Task Force Sigma-19-02 is tasked with cataloging any deceased or newborn members of SCP-2595 in order to maintain demographical control upon the population. Any sudden increase in population that exceeds the currently affixed number of humanoids is to be immediately reported to research personnel for further observation to be added to ongoing research. Mobile Task Force Sigma-19-03 is tasked with using multiple earthwork machinery to continuously create empty land plots matching the characteristics of those previously used by the entities. These land plots are to be surrounded by basic livelihood resources placed by Foundation aerial supplement drops that can be usable by the members of SCP-2595 to maintain the common course of life within the society. Land establishment is to be strategically planned in order to create a pattern to the nomadistic migration of the civilization and consequently prevent any contact with human-inhabited areas. Description: SCP-2595 is the collective designation for a nomadic society of 473 sentient humanoid figures holding an anomalous body composition constituted of a varying percentage of polyethylene and polysulfone, that currently inhabits several abandoned land plots in the region of ████████, Rostov Oblast, Russia. SCP-2595-001 to -272 (collectively designated as SCP-2595-A) constitute a social group composed exclusively of male specimen. This class serves a purpose similar to that of a feudalistic servant, taking on unpaid manual labor to maintain the nourishment and livelihood of itself as well as the upper classes. Upon questioning, members of this group vehemently deny the existence of slavery on the whole of SCP-2595 and avouch the significance of the practiced duties to the upper classes of the population. SCP-2595-273 to -398 (collectively designated as SCP-2595-B) constitute a social group composed of male and female specimen. This class serves a purpose similar to that of European medieval vassals, being widely served by the members of SCP-2595-A. It is estimated by the high percentage of cambium2 occurring in this proportion of the society that SCP-2595-B holds the largest economical capabilities of the four ramifications. SCP-2595-398 to -473 (collectively designated as SCP-2595-C) constitute a social group composed of exclusively female specimen. This class serves a purpose similar to that of a "council", aiding SCP-2595-B in decisions that directly affect the whole of SCP-2595. It is supposed that the frequent mass movement of SCP-2595 between abandoned land proportions is a decision made by of SCP-2595-C on a timely basis. In addition, the members of SCP-2595-C also seem to be widely recognized by the lower classes as the legal authority of SCP-2595. Recurrent observation of the behavior of SCP-2595 has recognized that the members of the society sustain a widely spread religious belief directed to a patriarchal deity that is recognized by instances of SCP-2595 as the direct origin of life for the anomalous humanoids. At the time of writing, attempts to unveil the legitimate existence of this figuration have been deemed unnecessary due to the idiosyncratic characteristics of the belief. Notice 2595-D1: As of ██/██/199█, the actual characteristics of SCP-2595-D are to be redacted from the main SCP-2595 database file. Direct access to the original description of SCP-2595-D should be restricted to Level-4/2595 or higher personnel connected to ongoing research. Isolated Containment Unit 2595-A is to be built around the original facility containing the instances of SCP-2595-D. Any inhabited housing facilities within a 30 meter radius of SCP-2595-D are to be gradually evacuated with the usage of Foundation-operated shell company "Progress Engineering"3. As a disinformation countermeasure, a covert construction site is to be built in previously occupied areas around the containment unit. Given the effects of SCP-2595-D when in close proximity with a human being or livestock, the security measures to prevent intrusion of the original site are to be made effective with the usage of preventive assessments4 and remote monitoring. Further activity of SCP-2595 that breaks the original perimeter defined by the containment unit is grounds for immediate revision of the aforementioned containment procedures in order to preserve the population currently living on the Russian shore of the █████ River. In an attempt to cease the effects of SCP-2595-D upon human life around its original containment area, Special Containment Protocol Theta-4 is to be enacted immediately upon the cityscape of ██████, Russia. The resulting submerged land plot is to be isolated and guarded by Foundation-operated armed vessels and submarines. The original enclosure of SCP-2595 is to be fixated on the ground with the usage of several reinforced steel counterweights. Disinformation Campaign Корчева́-4-2595 ("Leviathan") is to be spread within accessible mass communication systems to prevent the circulation of civilian watercrafts within the area. The creation of Mobile Task Force Sigma-19-04 ("Drill In Progress") is to be immediately organized in order to prevent any land approaches to SCP-2595-D with the usage of covert security perimeters in cooperation with the Ministry of Defense of the Russian Federation (MOD). The spreading of Disinformation Campaign Корчева́-4-2595 ("Leviathan") is to be ceased immediately to favor a new approach to the containment of SCP-2595. As a substitute, Disinformation Campaign Саратов-1-2595 ("Underwater Art") is to be disseminated within mass communication systems auxiliated by the usage of a reproduction of the original structure of SCP-2595-D currently located underwater and opened for visit in ██████, █████████. As of ██/██/████, all watercraft boarded by personnel should keep a safe distance of at least ten kilometers from Isolated Containment Site 2595-A to avoid spontaneous triggering of the anomalous properties held by SCP-2595-D. Description: SCP-2595-D is a spatial anomaly currently submerged at a height of 15 meters from the nearest surface within the ██████ Reservoir, █████ River, Russia. Visually, the anomaly consists of a collection of 473 statues made primarily of limestone that is directly connected to the society that composes SCP-2595. When approached by any sentient organism within a ten kilometer radius, SCP-2595-D will undergo a spontaneous modification. This modification is constituted of the complete disintegration of a standing statue located within SCP-2595-D and the simultaneous creation of a new structure resembling a figure of the original organism that came in contact with the expanding radius of the entity. Supplementary analysis of the phenomena taking place on the structures of SCP-2595-D has unveiled that the creation of a new instance is concurrent with the disappearance of adult human beings located around the area of the ██████ Reservoir. Additionally, it has been recognized by further observation that the creation of new human-shaped structures within SCP-2595-D coincides directly with the death of a senior member of the society designated as SCP-2595 and the following birth of a new component holding several characteristics that resemble the newly created limestone formation, including body shape, facial complexion and dressing amenities. Foreword: This transcript has been elaborated after SCP-2595-399 willingly submitted itself for interrogation within Foundation headquarters. It is hypothesized that this submission was a direct consequence of the triggering of Special Containment Protocol Theta-4 and the subsequent submerging of the ghost town of ███████ where SCP-2595-D was initially located. An initial feminine vocalization made by SCP-2595 using an unknown dialect is heard. Immediately after, a short audio transmission made by Foundation linguist Gregory █████ informs Dr. ████████ of the nature of the phrase. The following lines registered as spoken by SCP-2595-399 are a direct translation from Arcadocypriot Greek to Modern English. Gregory █████: This is a greeting, doctor. Please continue. SCP-2595-399: I apologize, hominid. I should have known the fact that your species is quite unfamiliar with these words. Dr. ████████: You do seem to understand me. SCP-2595-399: Why wouldn''t I? Your vocabulary was structured by a language quite similar to the one I use. Dr. ████████: Why have you chosen to speak to us at this time? SCP-2595-399: My visit has no purpose but that of a warning. SCP-2595-399: We have noticed your newest experiment to try and hide our existance from your own people. We have felt it. Dr. ████████: It is not my intent to hide your people. You should see, however, that we must also protect ourselves before we attempt to welcome a new civilization. SCP-2595-399: We are not a new civilization, doctor. We have been here before you, and we will be here after you. We foresee your destruction in your own hands. Dr. ████████: What do you mean by "destruction in our own hands"? SCP-2595-399: You treat the unknown with such ignorance and arrogance. You do not fear us, but you do feel the need to showcase your superiority by attempting to sink something that is not even yours. Dr. ████████: It was not our intent to "showcase superiority", however, the presence of SCP-2595-D has compromised a range wide enough to petrify a large amount of citizens. We cannot let that happen, no matter the legitimacy of your ideals. SCP-2595-399: It is far from petrification, doctor. We are but a display of your own evolution. We mean to aid, not to harm. Do not refer to us using a number. We are not one of your daily amenities, doctor. And you will realize that. In time. After the last transcripted vocalization, SCP-2595-399 refused to communicate any longer with Foundation personnel and was escorted back to its original group in the proximities of █████████, Rostov Oblast, Russia. At of time of writing, no further attempts of communication made by instances of SCP-2595 have been registered. 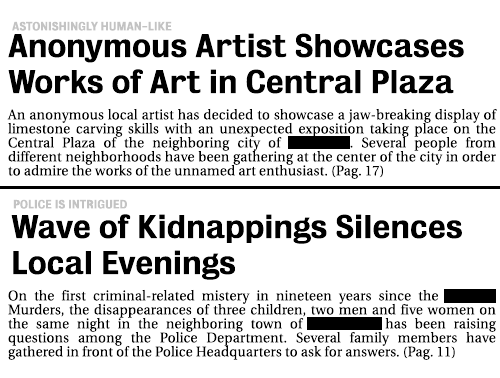 The following is a faithful reproduction of a local newspaper originally published on ██/██/████. Press reports from around the region of SCP-2595-D initially designated the anomalous activity of the entity as a "wave of kidnappings". Simultaneously, the reproduction of the statues broke the original perimeter of the █████████ neighborhood and began to materialize around the central region of ███████, Russia. The sudden change on the behavior of SCP-2595-D motivated a containment procedure revision made by Dr. ██████ Abranovíc and Researcher ████████ Gainsborough. 1. Typically, SCP-2595 will resort to a Arcadocypriot Greek dialect variation when attempting to interact with human life. 2. The economic activities occurring inside SCP-2595 are constituted exclusively of a cambium market variation. 3. English translation for "прогресс инженерной"
4. Including and not limited to a minefield and high-voltage electrical fencing.